Over and over again research has shown that photographs sell more than drawings. They attract more readers. They deliver more appetite appeal. They are better remembered. They pull more coupons. And they sell more merchandise. Photographs represent reality, whereas drawings represent fantasy, which is less believable. Being more true-to-life, photos can capture the attention of customers much more easily than drawings, which usually have an artificial feel. That’s why, as D. Ogilvy stated (“Confessions of an Advertising Man” 2004), photos tend to sell more merchandise and prove to be more appealing than drawings. Photos attract more readers. They can be easier to remember because they look more realistic than drawings. This is the main reason photographs can sell more, pull more coupons and bring more appetite appeal. Paraphrase 1 shows acceptable paraphrasing. Since the ideas are rendered with different words and the original source is properly acknowledged. Paraphrase 2 constitutes unacceptable paraphrasing, having failed to give credit to the author of the idea. In the second example, both sentence structure and words used are duplicated, which is a clear sign of plagiarism. 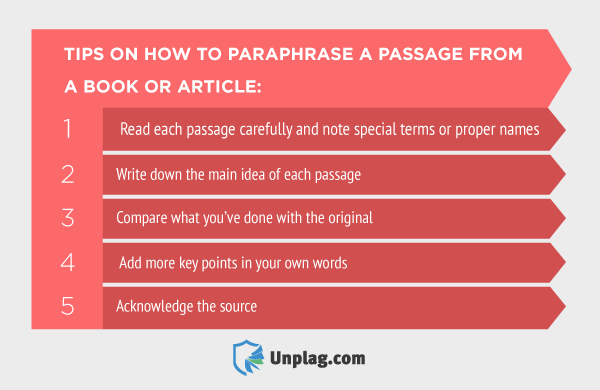 Check out our recent post on how to paraphrase using synonyms.